We are offering Fat Bikes Bicycle 26 Inches 21 Speed to our clients. We specialize in Philip type / Raleigh type and french bicycles. Please let us have inquiries with list of accessories. We can also offer you bicycles with balloon tyres (26 x 2 p 13/e) Other sizes of wheel sizes 26 x 1.5 x 28 x 26 x 13/8, 1.5 x 26 x 1.5 x 15/8, etc. Front Fork: Taper shoulder crown with BCP Crown Cover. Rim: 28 x 1-1/2" 32 x 40 Holes Westwood pattern BCP. Hubs: 32x40 Holes, Thick Barrel. Chainwheel: Sawan cut 44Tx7" - 1/2"x1/8". : Built of best quality ERW steel tubes, lugs less body, MIG welded. Fork: Best quality box crown less fork MIG welded. Handle Bar: Straight with bar ends and sleeves. Frame: Built of best quality ERW steel tubes, lugs less body, MIG welded. Fork: Best quality Fork blades. Brakes: Caliper brakes side Pull system. - We are in the business of designing and manufacturing quality Bicycles & Bicycle Parts to fulfill the requirements / Expectations of our domestic and overseas customers. 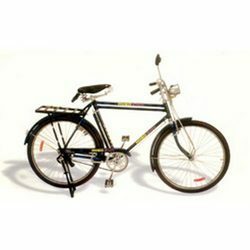 - Our vision is to become the most admired bicycle company in India through leadership in quality. - brake over size Tubes. - Front Fork : Uni Crown with cantilever brakes mounting studs. - Hubs : 36 x 36 Holes, Conical/parallex type Barrel. Specifically designed for the decoration of bicycle frames and components, this specialist decal paper is used by key bicycle brand owners, demanding quality decoration results. Blue tinted versions are available when white is incorporated into the design, allowing the exact detail to be easily seen.